Doima, 100 kilometers in a straight line from the mine, is the ideal place to locate the leaching facility, because of its abundant surface water resources and aquifers. On January 31st 2013 the town’s inhabitants, peasants and farmers, worried about their environment, occupied the only bridge that gives access to the town and the company’s working place, on La Opia river. This was a way to start a pacific protest held with banners with pro-life and water protection messages, blocking vehicles and employees of the corporation, leaving them with no access to provisions and working tools. As it was to be expected, the company found its way of entering the area. Despite of the insistent presence of the corporation in the region, the majority of the community is against mining activities, and insists that the company should abandon their land. Calling for help from the competent governmental authorities, the protest at the bridge continued. Our people have resisted the police. 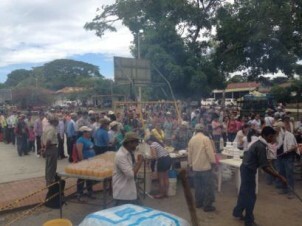 The mayor of the municipality was sued by the company, for allowing the violation of their free transit right, and the community had to rethink their strategy, but they didn´t abandon their cause. Piedras municipality lives from what they produce from the earth. Farmers have rice crops and other products like plantain, manioc and maize. This is why the region is called the “agricultural pantry” for the country. Worries about the future of this region have not disappeared, but grown with the presence of the company and with the various government actions in favor of foreign companies in other extraction projects in the country. The results of the vote were as follows. Of 5,105 people eligible to vote, there were 3,007 voters of which 2,971 voted against mining and only 24 votes were in favor of mining. According to Colombian Law 134 of 1994, this decision should be mandatory for our government, because more than one third of the possible voters participated, and votes against mining were far more than 50%. The community had to formally request the government to be able to hold the “Popular Consultation”. This is a civil participation mechanism that appears with our Constitution in the year 1991. Analysts say this will put local and regional governments in debate with the national government because the later will have to decide if it will give legitimacy to this democratic exercise, or will go forward with the development of investment projects without regard for the people´s opinion. Our government has great interest in opening opportunities for large investment extraction projects, and the Minister of Mines and Energy has manifested that the last word will be in ANLA´s (Environmental Licenses National Agency) hands. Some months ago, the national government enacted a decree (0934 of May 9 2013) that removes the possibility for municipal governments to decide if they plan mining zones in the environmental arrangement of their territory, leaving this decision in the hands of the ANM (Mining National Agency) and ANLA. This decree was appealed by the Mayor of Bogotá (our capital city), declaring it as “anticonstitutional”. However, because of this decree, the Minister of Mines could argue that the results of the vote in Piedras do not count in the government’s final decision. In July 2013 ago, the ANM Agency also gave a resolution that declares some mining projects as “of national interest”, the AGA project of La Colosa is on the list. This “national interest” concept appears an abstract notion without consideration of local realities when taking into account that not only AGA´s project is on the list, but other polemical projects in the country like the Drummond coal mine project in El Cesar which entered a strike last week and whose owner is sued in the USA for disappearing nearly 600 Colombian civilians in the past; the Santurbán gold mine, which has been criticized because of its location in one most valuable high mountain ecosystems (páramo) only found in Venezuela and Colombia; and the Cocigo Gold Mine project in the Vaupés Amazon region also called “the South American Avatar”, which is located within a protected area, which is illegal because this national park figure is the only one in the country that protects the subsoil. Unified and pacific resistance have been key for our process, and now our government shall decide if it will recognize the voice of its citizens in a democratic exercise, or shall it give priority to the international interests? Autonomy and participation in decision-making is the core of our Constitution as a democratic republic. In spite of this, the Minister of Environment and Sustainable Development said very recently on the radio that government waits for words from the Minister of Mines, who already said that the subsoil belongs to “the nation”, and it shall be the national government who takes the decisions. This concept of “the nation” appears abstract when it was the nation’s citizens who clearly pronounced themselves through an official mechanism. Anyhow, Piedras is for now only one of many options for the leaching facility as AGA has said, and that there shall not be any subsoil resources utilized in this municipality. Anyhow, the Piedras community did not vote against the subtraction of natural resources from the subsoil in their territory, but against any kind of mining activity and the use of water in its jurisdiction. Beyond this debate, the real debate here is how democratic actions are taken about by the government and to what extent can civilians really participate in the decision making process on projects that will affect them, their land and their future. This is why we want to manifest our support and express our solidarity to other communities around the world that are resisting extractive activities in their territory, and recommend governments to listen to its people and involve them in the decision taking regarding their land and future.In consequence, we are interested in establishing a constant communication with these communities in order to initiate a global network between communities with peaceful resistance efforts. Please receive warm regards and the best of luck from Colombia. We are attaching some articles about the Consulta Popular in the Colombian Press, most of them in Spanish.